Matt and I lived in Stephenville for ten and a half years now. Sadly, it's only just now, when we're on the verge of moving away, that I've discovered that I'm absolutely in love with a neighboring town, Granbury. One of the oldest historic towns in Central Texas, they have an adorable town square. It's also filled with Bed & Breakfasts, old churches, historic hotels, an old opera house that's still in commission. Earlier this year, I went with my friend Robin to the Harvest Moon Festival in Granbury. Tonight, Matt and I, along with some of his friends from work, went to see the Living Christmas Cards. A huge display of Christmas card-like backdrops, each card has actors who play out the card's scene/theme. While what we saw of them was neat, I was really most impressed with the decorated town square. Unlike Stephenville, Granbury does their town square up with tons of lights. It's absolutely beautiful. We had dinner in a little chicken place (Babe's) off the square, then went to see the cards. I have a really hard time with crowds, so I couldn't stand long in the crush of people around each card without my anxiety going berserk. Since it was almost impossible to see them from the back when you're 5'5", I spent more time looking at the square than at the cards. The lights strung to the top of the court house come from each of the four corners of the square and there's a huge star on top of the clock tower, though it's impossible to see that from this angle. The lights can be seen from miles away, all over town. So pretty, I had a hard time really finding a good angle, but I love how it looks through the tree branches. Each of the four corners in the square has a huge christmas tree. Each of them have a different color theme. While I didn't get a picture of all of them, I thought this one was really pretty. Here in town, our tree is tiny and far less lit by comparison--if you want to see it, I shared a picture on my Instagram. All the buildings in Granbury's town square, or most of them anyway, have christmas lights and all of the street lights are hung with pretty wreaths. Many of the windows have pretty displays with Christmas trees and lights, and snowy scenes. It really is a sight to see. 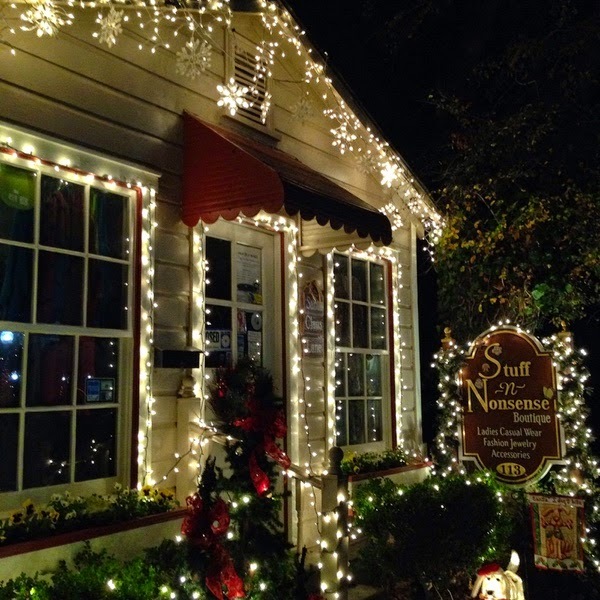 On the way back to the car, down a cute little street where the old buildings have wrought iron stairwells to the second floor on the outside, we came upon this little boutique all lit up for the holiday. I just love how it looks! And, in case you're wondering, it's just as cute on the inside. 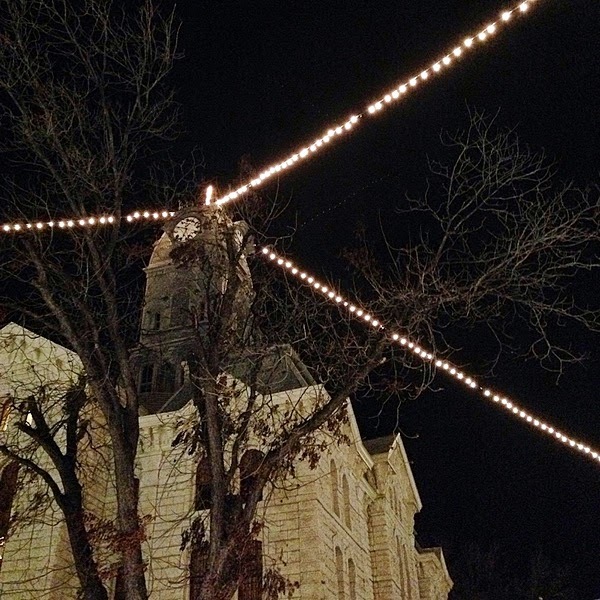 I'm happy that I got to see Granbury's town square all lit up for Christmas, even if it's for the first and last time. I'm particularly grateful because my darling husband, who went out of his way to take me there, is sick. He also had to work tonight--he's in the middle of 12 shifts in a row. So, he gave up what little time he had to rest--and recoup--so that I could see the Christmas lights and cards. He's an amazing man. I'm so thankful for him and all he does for me. Next year, I hope we're somewhere just as lovely. While I look forward to the challenges that moving brings, I'm sad that I've only just begun to discover what my own back yard has to offer. Between now and then, I'm going to work to enjoy it as much as possible! Beautiful, Kristyn! These pictures look like something from a movie. I especially love the "Stuff 'n Nonsense" shop. Needless to say, we have nothing like this in the desert! Thank you, Jodi! 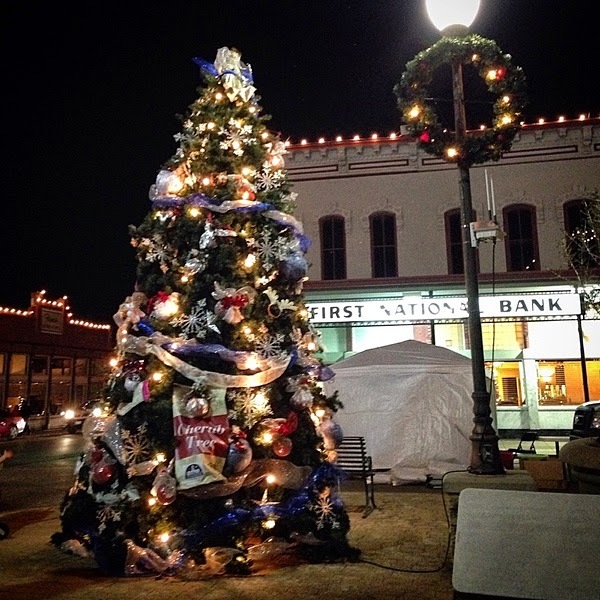 Granbury is about 30 miles from us and is so beautiful during Christmas. All year, really, but more so during Christmas.